Schmidt, B.; Petersen, M. H.; Braun, D.
Mosquitoes of the species Culex quinquefasciatus are vectors of many serious pathogens. Recent outbreaks of the Zika epidemic have raised concerns that this mosquito, which is more common than the established vector of the Zika virus, may also be capable of transferring Zika. A vector control and monitoring approach that has been discussed for many years relies on the use of pheromone traps. In the particular case of Cx. quinquefasciatus the ε-lactone (5R,6S)-6-Acetoxy-5-hexadecanolide was identified as the pheromone that regulates and initiates oviposition. 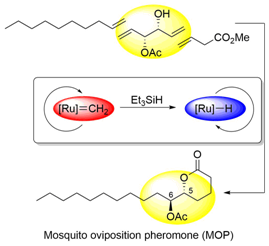 In this contribution a short enantiocontrolled synthesis of this pheromone and its epimer, which relies on two successive cross metathesis reactions, a tandem assisted catalytic metathesis-hydrogenation sequence and a Mitsunobu-inversion, is presented.